Hi, I am interested in your 1968 Chevrolet Camaro (stock #1680-TPA) listed on Autotrader for $33,995. I'd like to get more information about this vehicle and confirm its availability. 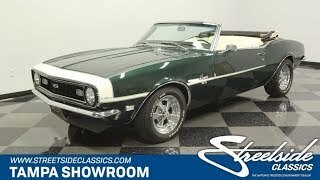 This 1968 Chevrolet Camaro Convertible offers a cool color combo inside & out and an upgraded V8 heart, so you know something this distinctive and desirable is rarely available for such an obtainable price. A Camaro re-done in the 1968-correct British Racing Green is always a very cool setup. After all, it has the dark tones we love on a muscle car. But when the sunlight hits this modern clearcoat application, the deep tones of the green really radiate as it rolls over the sheetmetals aggressive curves. Plus, this one has extra brightness that comes from nicely polished bumpers and the upgrade to iconic Cragar SS wheels. And then theres the white streak. The D90 stripe gives this some great SS style, and it coordinates with the white roof for a very distinct total presentation. If you like the way the white looks against the green then the roof is up, then youll love the presentation with the top down. The Deluxe white interior with comfy bucket seats and bright door panels give this classic a well-coordinated look when its open to the world. Even the details are great, like the working key buzzer and factory AM radio thats still on display. Plus, with black carpeting, you never have to worry about dusting off your shoes before going for a ride. And this Camaro begs to be driven. You get all the best classic elements, like the grippy three-spoke steering wheel, deeply recessed gauges, and the iconic horseshoe shifter in the center console. While youll love the color combo on this Camaro, your favorite upgrade will likely be under the hood. Its a 350 cubic-inch crate V8 looking quite tidy and polished. Plus, this has been enchased with performance components like a Holley four-barrel carburetor, Edelbrock intake, and Hedman headers feeding a rumbling dual exhaust. You even get an aluminum radiator w/electric fans to help keep this upgraded V8 running cool all day long. Plus, youve got a three-speed automatic transmission, power steering, and the grip of BF Goodrich T/As to keep this one feeling great on the road. A cool classic droptop with extra power and a distinctive look this Camaro really has it all. So dont let it slip away, call today!